Children become aware of money at a very early age. They quickly learn that it has the power to get things in stores. They know it is fun to carry around and to play with. It is difficult, however, for children to learn the meaning and value of money, when they see so many different kinds – checks, cash, credit cards, and reward coupons. To children, all these seem magical and it appears very easy to buy anything they want. Since money is not unlimited, children can begin to learn this when they are preschoolers. Taking your child to the bank with you is the first step to discussing the meaning of money. Talk about how you put money in the bank to save it and take it out to buy things. The best way for your child to learn about money is through experience. Your child can begin getting an allowance as young as three years old. Even a few pennies a week can make your child feel grown-up and become the basis for learning about saving and spending. When there is enough money to buy something, make a special trip to the store and let your child make a selection and pay for it without your help. In this way, the child can experience savings being exchanged for something wanted. This gives children another opportunity to make a choice. In the early years, an allowance should be used for things your child wants, but doesn’t need. Later on, children can start using savings for things they or the family needs. You can talk to your child in very simple terms about the things you need to spend money on (housing, food, clothing, electricity, transportation, etc.) and the things you choose to spend money on. Children usually “over-hear" conversation about money without parents being aware of it. They need to hear and understand that everyone has to make choices about how they spend and save. If your child is sharing in the family income, he/she should share in the family chores. Most young children love helping their parents and are able to do many jobs around the house. Never tie the allowance to how well your child does the job. If the child is not doing it well or at all, find out why and remind him that he is needed as a family worker. If the chosen job is too much for him, have him chose another task. Your might want to chose one that the child can do with you together. As children do chores and make allowance, here is a “piggy" bank craft to make for saving at home before taking the money to the bank or buying a special item. 1. Draw a pig’s face on an empty (thoroughly cleaned) plastic jug. The handle of the jug will be in the front as part of the head. 2. Decorate the bank with designs. Use adhesive stickers, permanent markers, or paper cutouts adhered with tacky glue. 3. Cut out ears from pink construction paper and glue these to the container. 4. Have an adult cut a wide slot with a craft knife on top of the container. Make sure the edges are smooth. This is where your child will place the money. 5. Glue on corks for the legs. 6. Poke a hole into the container at the back end and insert a curled pipe cleaner for the pig’s tail. 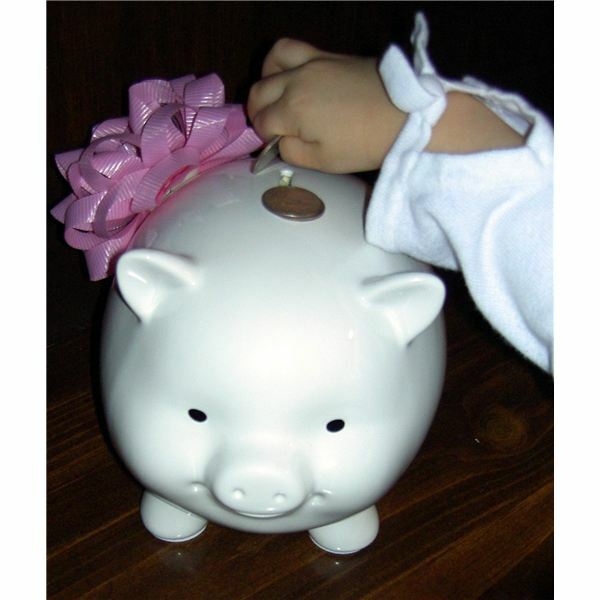 Enjoy making this “piggy bank" craft together and encourage the children to save their allowance in it. When full, challenge them to save some (maybe in a bank account) and reward themselves with a “want" they have been wishing for.